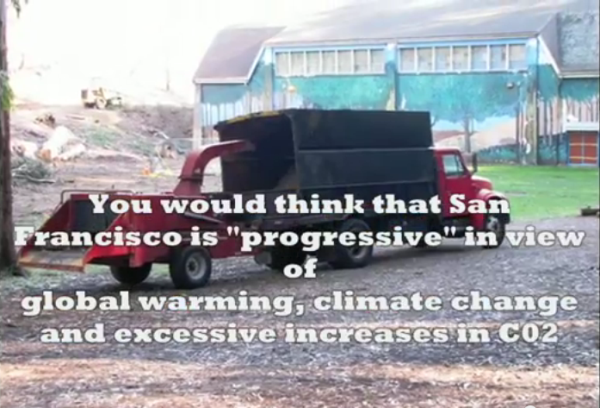 This article has been reprinted from the San Francisco Forest Alliance’s website. This tree is gone – the entire area is now bare ground. Click to see the 9-month update video. San Francisco’s Wreck and Park Department is now calling this “The Glen Canyon Playground and Tennis Court Project“. This is only a continuation of the mis-information that have been provided as the Glen Canyon Park Improvement Plan (note: they are spending $5,800,000 of the 2008 Park Bond Fund for Glen Canyon “renovations”). You will be seeing in this new video a bit more than just preparations for a new playground and 2 new tennis courts. The damage to Glen Canyon Park by the city is significant; we thought the project was the “removal and pruning of select trees”, but it is much more than that. And the wonderful children’s climbing tree is now gone; it once stood behind the Rec Center. But San Francisco’s Rec & Park Department cuts down healthy and treasured trees. Here is a reminder [Beginning of Glen Canyon Park tree destruction] of what was once there. On January 10, 2013 we reported on the start of this demolition project by the city. The grand eucalyptus trees at the Elk Rd entrance, over a century old, were quickly destroyed. Hundreds of other trees in the canyon, the ones the children love and climb in, the ones the birds nest in and bats hide in, the ones that feed the and protect the wildlife of this canyon – all will be gone by the time this project is completed next year. This entry was posted in Felling Trees and tagged environment, Glen Canyon Park tree-felling, San Francisco Recreations and Parks Department, Trails. Bookmark the permalink.